Toyota held TRD Takeover Day on its Twitter page yesterday. The Japanese automaker couldn't resist showing off the Camry TRD and Avalon TRD promised for the LA Auto Show, but looks are all we get - specs must wait until next week. In a series of videos, racing analyst and TV host Rutledge Wood hosts a number of Toyota-sponsored NASCAR personalities for their takes on the two hotted-up sedans. The videos get you ready for aero packages you'd never expect to see on a stock Toyota. 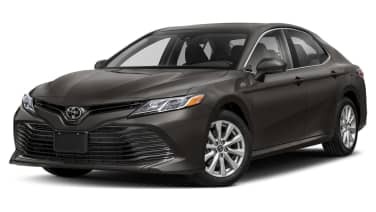 Both sedans get red-trimmed, jutting front splitters, aggressively shaped side sill extensions, TRD badging, and black multi-spoke rims on low-profile rubber. The Camry features a multi-level wing on the trunk, above a prominent rear diffuser and twin pipes at the corners. The Avalon wears a decklid spoiler, too, but it looks like a much more restrained flip along the rear edge. Inside the Camry there's red stitching on the dash, and seats with red-accented cloth inserts to go with red piping on leather bolsters, plus TRD-branded floor mats. Reigning NASCAR Cup Series Champion Martin Truex, Jr, drivers Kyle Busch and Hailie Deegan, and Fox commentator Jamie Little gather in the Camery TRD for convo, the obligatory donuts, and a J-turn. Judging by the Twitter video, the exhaust has been turned up, and you won't have any problem making the right kind of smoke with the tires. Whether that means a boost over the Camry XSE V6's 301 horsepower and 267 pound-feet (we doubt it), we'll discover in LA.